Mix 1 scoop with 6 oz. of cold water or skim milk in a glass or shaker cup. Mix 2 scoops with 12 oz. of water. Use between major meals and before and after exercise. Read the entire label before use and follow directions provided. MuscleTech researchers reviewed numerous clinical trials on whey peptides, and the science shows that whey peptides can promote rapid recovery from exercise! This superior whey plus isolate formula combines these rapid-absorbing, high biological value peptides with ultra-clean whey isolate. Each scoop of 100% Whey Protein Plus Isolate delivers 25g of ultra-premium protein that supplies 5.6g of BCAAs and 4.1g of glutamine and precursor. 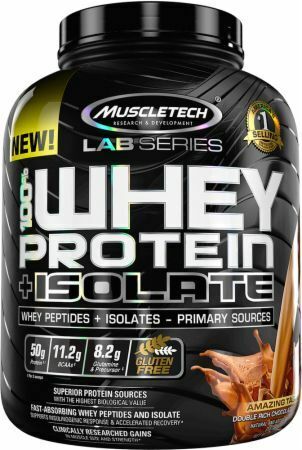 MuscleTech Lab Series 100% Whey Protein Plus Isolate uses only ultra-pure, micro-filtered whey protein isolate and whey peptides, the purest forms of whey protein you can feed your body. With a filtration process that uses precision technology to remove lactose, ash and fat, this amazing formula delivers the major bioactive protein fractions. Each bottle of MuscleTech Lab Series 100% Whey Protein Plus Isolate is fully disclosed with no proprietary blends, or hidden or underdosed ingredients. In addition, Team MuscleTech guarantees you are getting the exact amount of real protein that is displayed on the labels – each and every scoop contains the full amount of protein stated on the label and is 100% real protein! To ensure a high standard of quality and purity, each batch of MuscleTech Lab Series 100% Whey Protein Plus Isolate undergoes strict quality control and is third-party tested and verified to ensure that each bottle of has the highest purity, quality and consistency. We understand that, as an athlete, one of your key concerns is knowing exactly what you put in your body. That’s why Team MuscleTech is committed to providing the highest quality scientifically formulated products that are free of banned substances, and that’s why each batch of MuscleTech Lab Series 100% Whey Protein Plus Isolate is guaranteed to be banned substance free, so you can rest assured you’re taking only the best to be the best.